To give this first burst of Fall a proper Kettle Kitchen Kick Off, I decided to bake one of the things I baked most with Grandma, Challah Bread. Neither myself, nor my grandmother is Jewish, but we call it Challah anyway. It could be called Egg Bread, some call it Julkage, or even Hoska. I call it, the best bread I’ve ever had. The Egg Bread recipe follows. Give it a try, it’s not as complicated as it looks. More pictures of the process are located in the Gallery. In a large mixer bowl combine 3 cups of the flour and the yeast. In a saucepan heat milk, sugar, butter, and salt just till warm (115 degrees to 120 degrees) and butter is almost melted; stir constantly. Add to flour mixture; add eggs. Beat at low speed of electric mixer ½ minute, scraping bowl. Beat 3 minutes at high speed. Stir in as much remaining flour as you can mix in with a spoon. Turn out onto a lightly floured surface. Knead in enough remaining flour to make moderately stiff dough that is smooth and elastic (6 to 8 minutes total). Shape into a ball. Place in a lightly greased bowl; turn once to grease surface. Cover; let rise in a warm place till double (about 1 ¼ hours). Punch down; divide dough in half. Cover; let rest 10 minutes. 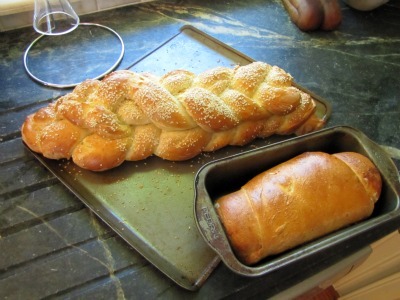 Shape into 2 loaves, OR create a double braid. Cover and let rise till nearly double (35 -40 minutes). Bake in 375 degree oven for 35 – 40 minutes or till done. Cover with foil the last 15 minutes to prevent overbrowning. Remove and let cool on wire rack. Prepare Egg Bread as above, except instead of forming into loaves, roll out dough, wet lightly and sprinkle with cinnamon and sugar. You could also sprinkle raisins on the dough. 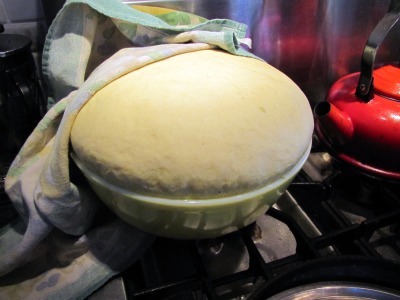 Starting at the narrow end, roll tightly toward the other end and place in a two greased loaf pans with seam side down.